So What Do Low Interest Rates Mean For Investors? On the one hand, low bond yields mean that the opportunity cost for not holding bonds is low. Therefore, investors are more inclined to invest in stocks, especially if the S&P 500 dividend yield is higher than the 10-year Treasury bond yield. Just imagine if the 10-year Treasury bond yielded 10%. You may not be inclined to risk as much money in the stock market because the 10% is a guaranteed annual return if you hold the 10-year bond to maturity. That said, if the 10-year bond yield is at 10%, it likely means there is rampant inflation due to massive wage pressure and accelerated corporate earnings. In this scenario, stocks may very well return much greater than a risk-adjusted 10% a year. Declining mortgage rates also means more people can afford homes. The real estate market is unlikely to collapse under a wave of mortgage defaults because the credit quality of mortgage borrowers has drastically increased since the financial crisis. The average FICO score for an approved mortgage is over 720, and you no longer have NINJA loans that don’t require any money down. Those adjustable rate mortgages that are resetting today aren’t going to see a large uptick at all. Meanwhile, homeowners who missed the massive refinance window before November 8, 2016, have another chance to lock in a low rate. On the other hand, investors should be a little worried that despite all signs pointing to a healthy economy, so many investors are choosing to buy US Treasury bonds for only a ~2.2% annual yield. The logic goes, if the economy is so awesome, why wouldn’t you sell bonds and buy as many risk-assets as possible to get as rich as possible? What does the bond market know that we do not know? The answer lies in still benevolent inflation figures and FEAR. Anybody who has been investing for the past 20 years or longer has seen boom bust cycles come and go. Everything seemed hunky dory in 2007 when the unemployment rate hovered at only 4.5% and the S&P 500 consistently returned double digits for years. Then everything fell apart. You never know when sentiment will turn, but when it does, the fall is always quicker than the rise due to the fear of losing everything. Low interest rates means more leverage. More leverage means more violent destruction on the downside. Therefore, it’s better to sell risk-assets in an appreciating market. Even though you won’t catch the top, it’s much better than trying to sell in a declining market when the demand floor drops out from under you. Stocks, bonds, cryptocurrencies, and coastal real estate are all expensive today. As a result, I’m not adding to any of my positions at the moment, but instead, deleveraging by paying down mortgage debt and raising my cash balance. My immediate goal is to take profits in one of my SF rental properties and redeploy the proceeds into cheaper middle America real estate. Real estate rose to ~40% of my net worth after I purchased another home in 2014, and I’d like to get the figure down to a more conservative 25%. I wish the good times can last forever. Heck, even Fed Chair Janet Yellen said on June 27 that she doesn’t believe there will be another financial crisis for at least as long as she lives, thanks largely to reforms of the banking system since the 2007-2009 crash. Let’s hope Yellen lives a very long life then! Because the way the Fed is hiking short-term interest rates, the yield curve will flatten and eventually help cause another recession. * Ignore people in the real estate industry who say, “Buy now before interest rates get too high!” or “Refinance now because interest rates are rising!” They don’t understand interest rate fundamentals. * If the short end of the yield curve (Fed funds rate) rises faster than the long end (10-year bond yield), the yield curve will flatten. A flattening yield curve means investors are not being compensated for holding longer-term securities largely due to muted inflationary expectations and greater fear of the future. A flattening yield curve can sometimes be a signal for an upcoming recession. * Pay attention to national inflation and unemployment rates. These are the two figures the Fed focuses on the most. The Fed targets an unemployment rate of between 4.7% – 5%, and an inflation rate of 2%. 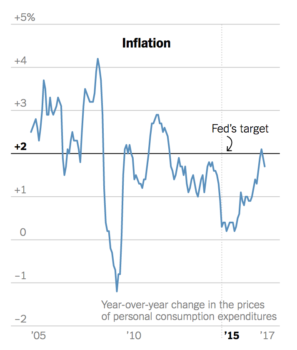 If inflation comes in much higher than 2%, the Fed will have a tendency to raise interest rates more aggressively. With the current unemployment rate at roughly 4.3%, the Fed is anticipating wage pressure growth, which ultimately leads to higher inflation. Now pay attention to your local employment figures. * Never confuse brains with a bull market. Arrogance is wealth-destroying. Try not to fight the Fed or the government either. The Fed wants to enrich asset owners at the expense of non-asset owners. The government, with its pro-housing rules, wants every American to own a home. But sometimes, things get out of control. Look towards lower valuation, higher yielding properties in the heartland of America instead. I’ve personally invested over $500,000 with real estate crowdfunding to take advantage of much cheaper real estate away from the coasts. Refinance your debt: Check the latest mortgage rates, auto rates, personal loan rates, and more through LendingTree. They’ve got one of the largest networks of lenders that compete for your business. Your goal should be to get as many written offers as possible and then use the offers as leverage to get the lowest interest rate possible from them or your existing bank. When banks compete, you win. Thanks for all the information. I was just able to lock in a rate of 4.0%, which although not the best I’ve seen anywhere was competitive. I am buying a co-op in the NYC Metro area, so I wanted to use a bank and mortgage broker that was familiar with this specific co-operative. I may be making too much out of the whole co-op board approval thing, but I will report back once the process is complete. It’s also worth noting that at the end of a Fed tightening cycle that an increase in the short-term federal funds rate actually fosters lower long-term mortgage rates, as the braking effect of higher short-term costs eventually slows the economy and inflation potential. Slower growth means less benefit to holding stock and risk assets, so investors reposition themselves out of equities and into bonds, first to take advantage of locking in the highest possible yields for the next cycle, and often later for defensive purposes. With regard to Ms. Yellen’s comment that she doesn’t believe there will be another financial crisis for at least as long as she lives, she’s probably right. True crises take a long time to build, as they are usually complex structures built in gaps and gray areas of law, regulation or oversight, sometimes even by exploiting otherwise popular and beneficial public-policy goals. The most recent was built out of well-known areas of risk layered one on top of the other, as no lessons were learned (or regulated away) after the S&L crisis of the mid-late 1980s (neg-am and short-term ARMs, low-and no doc loans) or those in the late 1990s (high LTV loans of 125% or more and considerable subprime losses). There are plenty of other aspects that made this crises worse (opaque structured finance vehicles, all-time lows for incidence and severity of loss leading up to the tipping point and more). Suffice it to say that while the next crises will probably be different, it will eventually come, but perhaps not until Ms. Yellen (and most of us) are long since gone… and probably won’t start here in the U.S., either. While 10y Tsy have rallied over the last few months, LIBOR remains on a one way path higher, up over a full 100 basis points and now at 1.30% compared to .30% before the Fed’s first hike in December of 2015. The Fed also seems like it wants to keep going, with 1 more hike in the dot plot for this year and another 3 hikes next year! (Eurodollars aren’t buying this story, with the next hike fully priced in by June of 2018 in the OIS markets while the December meeting as roughly a 50% chance of hike priced in). That means we could be looking at a 3m LIBOR rate of 2.30%+ in a little over 12 months. ARM holders are getting hit much harder than we may have thought they would just a year ago as the Fed is turning slightly more hawkish and wants to keep the hiking momentum going. Why wouldn’t the Fed keep going? GS Financial Conditions Index are at one year lows even after 3 hikes thanks to weak USD and strong risk asset prices. The point is that while new 30y conventional fixed mortgages are indeed lower in rate, existing ARMs are moving higher. Good point. I wrote about this: Attention ARM Holder: Refinance Now! The good thing is, ARM holders can simply refinance into relatively better value 30-year fixed mortgages if necessary now. Glad I bought a house and car in December with loans at an interest rate of 3%….15 yr and 4 yr. Just happened to be the year we wanted to buy a house and my old car just died in the second week of December. Wow, that was super educational! I feel like I should pay you for that crash course!!! This is so true. Nothing goes up forever. Not in real-estate, not in the stock market. Thanks for the insight in this article! Btw, on an unrelated note, what do you think of Warren Buffet’s recent purchase of Canada’s Home Capital shares? Being mortgage-free I hadn’t been paying attention. But it is a very interesting “phenomenon” taking place. It’s sort of funny because people were using the scare tactic not long ago (and probably still now) that you MUST refinance ASAP because rates are going to go crazy!!! :) Well, it’s not happening yet. That said, I am a huge fan of locking in low rates if your current rate is a lot higher than what you can currently get in a refinance. What’s the direction of your CD? 3% is pretty good! By direction do you mean current rate? The CD is from Andrews Federal Credit Union and was discussed on Boglehead’s website. It was 3% APR back in January for a 84 month CD with a 6 month early withdrawal penalty. It is NCUA insured. So after a year it is at worst a 1.5% CD if I pull out early. Andrews current 84 month product is only 2.2%. I think we might have hit an inflection point in long end rates over the last two weeks. Yellen talked more hawkish than expected at the last meeting, despite PCE weakness not looking transitory. It seems that with risk assets trading at elevated multiples and GDP chugging along the Fed may see a window where they can attempt to normalize faster and reduce the balance sheet. Even if inflation is running a bit below target. ECB and BOJ continuing QE purchases have kept global financial conditions at extremely easy levels. This has basically negated the Fed rate hikes thus far. However, now Draghi is hinting harder at a QE taper soon. The global central banks may all be on board with an attempt at tightening and the Fed balance sheet reduction will finally start to reduce global central bank balance sheets. If the Fed walks the walk and begins reducing its long-end concentrated balance sheet then I think we might be surprised at the jump in long end rates this summer and into next year. Central banks have erred on the dovish side since ’09, so this recent talk gives me more confidence that they will actually try this reduction. So much of risk asset multiple expansion has been justified by comparably low interest rates and liquidity injections. While global balance sheet expansion creates a bid in all markets (Equities, Treasuries, Commodities, Gold etc), I think that the reduction will cause a drop in all of these. Meaning there really isn’t a “safety” market here. Just ones that are less painful. I don’t necessarily think that this is a big one like 2000 or 2008 though. More likely that market needs a 15-30% taper tantrum to hit a painful enough level for the Fed to turn more dovish again. In the long run though I agree with your theory on low rates for longer. The Fed will either hike us into recession or the business cycle will eventually run its course, causing interest rates to again drop. 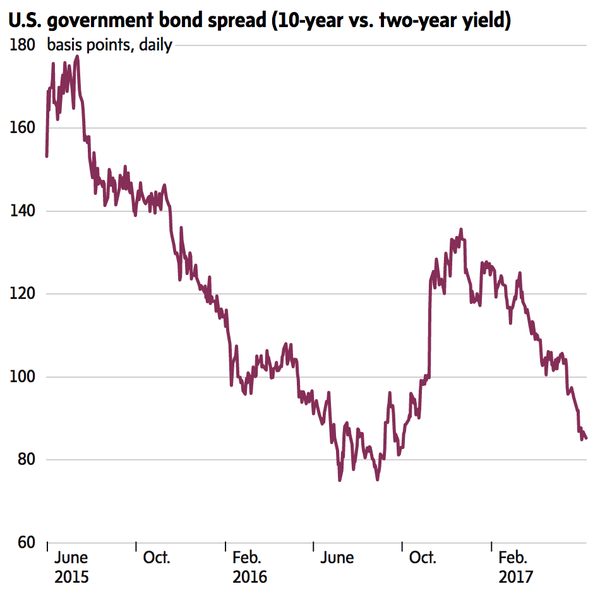 Rates are likely stuck near the zero bound for economic expansion to continue and for risk assets to not implode. The question is how long can that last until debt levels are finally too burdensome and either a big deflation or hyperinflation event is needed to reset the whole thing. Japan’s been chugging along like that for 25+ years, so it could be a long time. “Better to sell risk-assets in an appreciating market” – makes a lot of sense but I never really thought about it before. It would definitely help with liquidity issues. Thanks for this post, it really helped clear some things up! Very nicely laid out article and educational for the readers. Being an external auditor for bank clients, explaining the yield curve and what/how different it truly is in what the Fed does vs. what long-term rates do is always fun and confusing to some. I believe the over arching goals are here to diversify income streams, don’t be heavy in any certain one asset and just because of sheer appreciation over the last 8 years – don’t become arrogant! Talk soon FS. Excellent insights Sam, as usual. I’ve been reading Financial Samurai for years, and you never fail to give an honest, accurate viewpoint of what’s going on. What would you recommend to a 26-year-old looking to FIRE by 40 given our current environment? I would model out three financial scenarios over the next 14 years. And each scenario, assume different savings rates, different income levels, and different returns. With the modeling, you’ll then figure out how much you need and what you can do in case something bad happens. What do you have a realistic plan, your confidence will search because you’ll know how to deal with uncertain outcomes. What do you think about the idea of pulling cash out of investment and primary residence real estate and parking it in conservative yielding close to cash assets to make the most of low interest rates and the refi opportunity and delay increasing leverage? My lesson in 2008 was cash (liquidity) is king when it comes to paying mortgages and other expenses on investment properties. Once the recession hits the refinance opportunity is missed as banks tighten lending criteria, rates increase, and valuations fall. If you had a chance to pull out 200k in equity at 2.75% (primary residence) where would you redeploy or park it for capital preservation and yield? CD ladder, money market, something else? It might not be a bad idea if you know your job is at risk and the assetwhere you can park money in as a yield comparable to the interest-rate. Banks will definitely stop lending out home equity lines of credit during a recession or financial crisis. I remember a lot of banks we’re encouraging me to take out a home-equity line of credit back in 2009 and 2010. I didn’t because I was wary and had a decent cash balance. I just hate taking on more debt if I don’t need it. I love dead within appreciating asset. But I just hate debt as a neutral for liquidity reasons. I just feel if necessary, I can just totally/costs and aggressively side hustle to have more money. Great post, FS! Am loving that first chart showing the Fed Funds interest rate history, many people without ‘skin in the game’ don’t have that visceral memory of watching interest rates sink, sink, sink for 35+ years, let alone correlate it with buyers’ ability to acquire 50% “more” house for the exact same nominal mortgage payment as 25 years ago in 1992. That’s true, the debt will be harder to walk away from later. However, the positive of this point is that less people will walk away from their homes, which means less of an implosion if the time comes. I’m hopeful! But I do see how wealth gap continuing to widen , Probably forever. Because it is when there are massive corrections when there is an opportunity for the less wealthy to take advantage because the less wealthy by definition lose less. True. For the night is dark and full of terrors! I frequently return to your article on fed funds rate vs the 10 year treasury and how to think about rates. It is empowering but I recently did get a fixed rate locked. Oops. Let me explain. I have three properties including my primary home. Primary is a 7 year Arm at 3%. I used a heloc from one of my LA investment properties last year to purchase another in LA 6 months ago where I put 45% down and the heloc did the rest. I talked to the bank recently got a loan for the the second investment property at 15 year fixed at 3.1% (I read your article on interest rates for investment properties recently and felt this was a good deal). The bank then will use the proceeds to cover the heloc so I get the full power of that down the road. I felt a fixed rate increased my purchase power. Also just a thought: maybe updates to the interest rate for invesment properties article and also maybe another article on your views on the investing and the balancing act of flat/negative cash flow vs appreciation on the coasts. I think you’ll enjoy an upcoming post about when to buy rentals and when to rent your property based on math. It makes a lot of sense and I think this is something more Real estate investors will follow overtime as the world gets smaller thanks to technology. Do you feel OK leveraging up at this point in the cycle by using your home-equity line of credit? I never got comfortable with that big is borrowing money to borrow money destroyed a lot of people in the past. How confident are you about your cash flow? Crap, sorry Sam my long reply got deleted on an error message when I hit ‘post comment’. I will try to sum it up. On my primary home I put 40% down on a 7 year ARM. I used a HELOC from one rental property that I purchase out right to help pay for a second rental property where I put 45% down as well. I then checked with the bank and they offered the loan where the monthly payments were essentially what I was already paying monthly towards the HELOC ( I was paying more to pay down principal as well). So we created a mortgage on the 2nd property. Hence, I currently only have 2 mortgages. I got the full power of the HELOC back. It costs nothing to have unless I use it towards something again (would have to be an amazing deal on an investment property). West Coast returns are what I am getting 3-4% after costs including mortgage but I also put down quite a bit as well and own one straight up. I am using extra cash from the returns on deals on Realtyshares (per your suggestion but primarily in the Southeast). I look forward to the post. I had the idea bc I was piecing together some of your articles to determine that west coast rental properties seem to require more down, higher interest rates (all rentals), and tend to be an appreciation play. This later point is what I was hoping to learn more about form you and maybe other readers would be interested to hear this as well. I guess the entire West Coast is this way? But if the appreciation = speculation then are we all delusional? Including me. With 45% down on both properties, you’re doing fine. You’ve got such a huge buffer. Just make sure your cash flow outside of your rental properties is strong! This is gold. I started my pay downs of property about a year ago! My immediate goal is to take profits in one of my SF rental properties and redeploy the proceeds into cheaper middle America real estate. Real estate rose to ~40% of my net worth after I purchased another home in 2014, and I’d like to get the figure down to a more conservative 25%. Sam, when you say this are you not counting crowdfunding investments in real estate when factoring it into your percentage of net worth? I am curious because I have always considered it in my real estate percentage regardless if I owned it directly or through crowdfunding. Maybe I am reading it wrong. It counts. I’m just not going to redeploy all of it. I should clarify that. Also, I feel I have too much exposure to coastal city real estate. After a gangbuster 15 years, I think it’s wise to diversify. I can essentially invest 1/4 the amount of money in heartland real estate, and get the same cash flow. Which means, I have 75% leftover capital to reinvest or just keep it as cash for a rainy day. Great article Sam! Let me think it a bit further. You’re saying that the 10yr bond yield will not go over 3.5% in the foreseeable future. Considering that by 2020 the FED is expected to raise interest rate till 2.25%, I assume it would mean a quite flat yield curve if the 10yr is still below 3.5%. Would that be the sign of the next big recession, i.e. time to jump into bonds again (although I read you already started)? If the fed funds rate goes to 2.25%, yes the yield curve will be very flat, and if the economy hasn’t gone into recession by 2020, it soon will. And if the 10 year treasury-year-old is indeed a 3.5%, then I would be aggressively buying bonds then. There are multiple variables to this equation because nothing trades in a vacuum. Maybe the Federal Reserve gets the hint that they shouldn’t raise to 2.25%, and will just stop at 1.75% or 2%. Yes, I aggressively started buying bonds in December 2016 and January 2017. I basically spent 90% of my liquidity at the time. Now the bond market is too rich, and I’m just waiting. As always, I have to read your posts twice because you provide so much great insight. It would have been great for the whole economy if there was a bill to update/upgrade the U.S. infrastructure. It looks like that is not going to happen. A massive government spending project like that would have extended economic growth for years to come. As you stated, things seem to fall apart quickly like in 2008. At least the quality of mortgage holders has greatly improved since that period. 10YR analysis was excellent, but I think the biggest takeaway for real estate is the 30YR Rate and inflation expectations. If you can pull in a 5yr5yr inflation expectations chart (5yr inflation expectations, 5 yrs from now), it has come in considerably. Tech has been a deflationary wave that’s only been slowed by zero interest rate policy (ZIRP). Plenty of factors to think about, and who knows what happens to rates. But if a deflation wave does hit, investors need to remember how much worse it is to be holding debt then. Deflation = Debt becomes more burdensome. Lets see if those animal spirits rage again! Good point. About the flexion. It is amazing that just a couple years ago people were worried how about negative interest rates. And now it’s back to bull markets. The general trend is that everybody wants to put Money to work and get richer. Therefore, going to short the market is a death long-term. The best thing one can do is raise cash and not try to overly profit from downside risk. Thanks for a great article, Sam! You’re right, I’ve heard too many realtors say to buy a house before the interest rates go up… “But the house is overpriced” just doesn’t seem to register with them for some reason, haha. I always get nervous when people (especially influential people like Yellen) say there’s not going to be another recession for a long time… There is going to be another recession, and I don’t know anyone who can predict exactly when. Hopefully a healthy dose of respect for the market came out of the 2008 crash and we can postpone that recession for as long as possible. One thing I’ve been thinking about lately is what will happen when the FED eventually stops reinvesting maturing bonds and lets their balance sheet gradually decline, and the effect this will have on the yield curve. Conventional wisdom would seem to suggest that this would put upward pressure on the long end of the curve, but I’m curious if the opposite could actually happen, and we continue to see low or even lower long term rates. In a world of low interest rates, the FED showing discipline may attract even more foreign investment because they see the FED as being prudent and disciplined in a world of easy money central banks. Also, the low return on US treasuries may still be higher than other government bonds like you mentioned in this article. I’m starting to wonder if low interest rates are here to stay for a while in the US… Curious to hear your thoughts/input! I strongly believe low interest rates in the 10-year and in the mortgage market will be here for the long term. I’ve said this since the beginning of this site and in my previous career, and I’ll triple down today. I will be shocked if the 10-year bond yield ever gets back to 4%, or even over 3.5%. We’ve been in a 35 year bond bull market. I don’t see this changing w/ information efficiency, technology, globalization, and knowledge of past cycles. Its funny how many people think that this rate cycle could get us right up to historical 10 year yields of 4% in the next couple of years. It took over 20 years for 10 yields to increase above 4% in the 40s and 50s, which is they last time they were compatibly low. They could rise rapidly but that is not what they have historically done from the levels we are at today. I was surprised that Yellen had said that too. No recession in her life time! When I bought my current house there was a lot of people saying interest rates will never be so low. I locked in a 7 year arm at 2.85% and everyone chastised me that I should go with a 30 year fixed mortgage. That would have cost me $60K more over the 7 years. I am with you on this Sam. If interest rates begin to rise, then I can reassess, but I think it will be a while before we see crazy high rates. Plus in the next 6 years I can continue to pay down my mortgage debt making any future mortgages (even at higher interest rates) cheaper. Your friends and acquaintances clearly haven’t read this post from years ago! Anybody who got a 30-year mortgage over the past 30 years has paid too much in interest. Careful – she said no crisis – normal recessions are not a crisis and I’m sure she meant crisis not recession. That’s true, but if we have a one-year recession and a 20% correction, no big deal. It’s probably healthy. Thanks for the post Sam. I appreciate how simply you lay out the macroeconomics affecting mortgage rates and then tie it all back to your near term investment strategy. Your site has such variety in its content. Though this post may not go viral, this is exactly the kind of content that keeps me coming back. I have been developing my side income streams primarily in real estate (1 Airbnb in Seattle, 1 long term rented duplex in a Seattle suburb), and I plan to continue growing that portfolio over the next 5 years. With rates falling I have been tempted to leverage up and pull some cash from the Airbnb to accelerate buying another duplex. Your post suggests you would avoid inceeasing leverage in this market due to likely over-valiation of certain assets and the magnified impact if there is a correction. 1. How would your near term investment strategy look of you were still grinding in your finance career and not in your current “De-risk, de-complicate” mode in general? 2. Do you think real estate assets that are currently cashflowing with cap rates above 5% are also exposed to correction, given rents stay fairly sticky? Thanks so much for doing what you do. You’re an inspiration! Up vote this! I was trying to figure out how to ask basically the same question. Congrats on developing your rental income and real estate portfolio, especially in very strong locations. I’m assuming at the age of 31, you are starting to get tire of mega corp and want a way out? Where are you based and do you live in your primary residence? If not, I’d start with that. I would NOT pull money out of your Airbnb rental to leverage up and buy another place. If you want to buy another place, I would buy based on the NEW savings you accumulate that will allow you to afford to buy e.g. 20% down, cash flow positive from month one. It is a frenzy now in the Pacific Northwest. Buying during a frenzy with added leverage is playing with a nuclear bomb. Everything is exposed to a correction, in a correction. Everything. Whoa! thanks for being so forthcoming with the advice. I was 50/50 on cashing out, but you’ve tipped me over. Old fashioned grinding it is! Speaking of grinding, yes, at the ripe age of 31 I have a young family that I’d love to have more time with and i’m watching my physique slowly deteriorate year after year. My career isnt quite as exhausting as yours was, but it is fundamentally … not what i’m trying to do for 50+ hours a week for the next 30 years. So we’re saving aggressively and trying to make the right moves. Are you absolutely sure you want to sell one of your SF properties and move the profit? I’ve read your “moment of truth post”, so I saw your pros and cons list… but here’s where i get stuck… Do you really think you’d reflect in 10 years and say “Man, I’m sure glad I sold that big beautiful home in one of the San Francisco’s most desirable neighborhoods!” Doesn’t that sound unlikely?? Thanks for the reply. I’m still curious what your investment strategy would be like right now if you weren’t already FI and were still growing towards it. What would 31 year old Sam be trying to do in this environment? 31-year-old me would want to lower my leverage and lower my risk as well. I would be telling myself that if I get hammered in the markets, that just means many more years of work, which would seriously bum me out! The irony now is that there isn’t a pain point because I don’t think I’ll ever have to go back to work again Even after a 50% haircut. That said, I still don’t want one! If I didn’t already have another primary residence which I really love, I wouldn’t sell the rental house. But I do, and after 2 1/2 years, I’ve made it exactly the way I want it. Have you shared the latest on your decision whether to sell your Rental? Will you share a listing on FS if you end up selling? Wow this is such a great explanation. 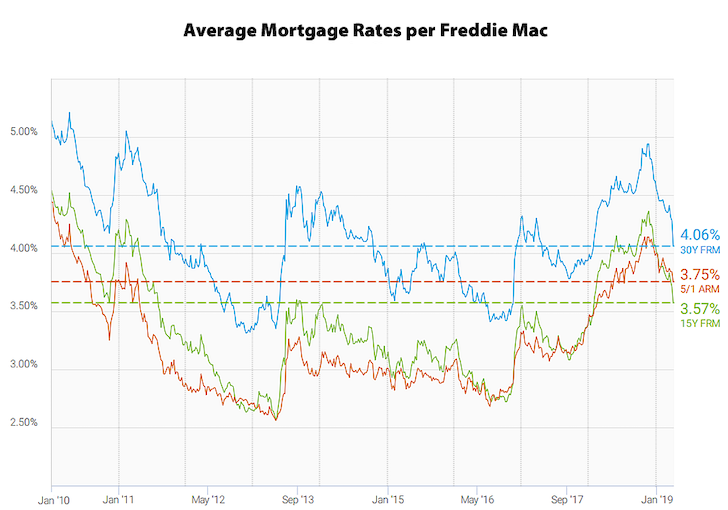 After buying our house in early 2016, we just never looked at mortgage interest rates again. 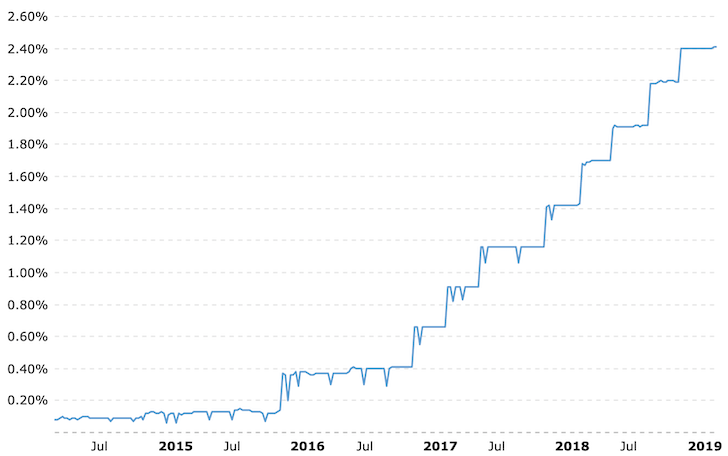 I just remember our realtor kept telling us to be quick with the house purchase in late 2015 since the Fed was going to raise the interest rate in 2016. Excellent analysis as always, Sam! Uh-huh, right. I guess anything is possible but Alan Greenspan also thought everything was groovy until it wasn’t. I make small adjustments to my annual asset reallocation based on an adjusted CAPE. I realize CAPE is far from perfect but I use it like a probability meter on whether the market is more likely to go up or down. I am surprised with what she said, but at the same time, the Government and the Fed have a roll of assuaging the markets that everything will be OK. Because at the end of the day, it’s all about having confidence in the market to invest. No bank holds 100% of their deposits. Instead, every bank lens out a majority of their deposits which creates a massive unwinding when everybody suddenly decides that the good times must end.